ONE of the most beloved of American presidents, William McKinley served as the nation's chief executive during a time when the American people surveyed their world with confidence. Recovering from a severe economic depression after his election in 1896, they dreamed of unprecedented economic expansion. Then the stunning military victories over Spain in 1898 reinforced a sense of national purpose as the United States took its place among the great powers. McKinley received much of the credit for achievements at home and abroad as the nineteenth century drew to a close, and under his leadership Americans welcomed the new century optimistically. McKinley was the first truly modern president, but his enormous popularity derived from something more than his capacity to move with the times. A man of integrity, he firmly believed that the nation must adhere to the fundamental principles on which it was founded. With copybook truisms, uttered no less sincerely because they were truisms, he managed to convey a sense of fidelity to those principles. Thus, despite the momentous events over which he presided, he was able to reassure the American people that they had not broken with the best of their past. Four outstanding studies make available a wealth of information on William McKinley and his times. 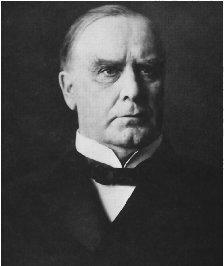 H. Wayne Morgan, William McKinley and His America (Syracuse, N.Y., 1963), the most complete and balanced biography of McKinley, emphasizes McKinley's nationalism to provide an important insight into his administration. A second volume by the same author, From Hayes to McKinley: National Party Politics, 1877–1896 (Syracuse, N.Y., 1969), theorizes that by subordinating local interests to national concerns, the Republican party laid the groundwork for the modern political system of the United States. Margaret Leech, In the Days of McKinley (New York, 1959), is a gracefully written, comprehensive history of the McKinley administration. A more recent volume by Lewis L. Gould, The Presidency of William McKinley (Lawrence, Kans., 1980), is persuasive in presenting McKinley as a leader who skillfully used the powers of his office to become the first truly modern president. Economic developments affecting McKinley's political activities receive attention in Harold U. Faulkner, Politics, Reform, and Expansion, 1890–1900 (New York, 1959). The detailed study by Milron Friedman and Anna Jacobson Schwartz, A Monetary History of the United States, 1867–1960 (Princeton, N.J., 1963), is important for understanding monetary issues of the 1896 campaign. Two sophisticated political analyses are valuable for assessing McKinley's advancement to the presidency: the first is Richard Jensen, The Winning of the Midwest: Social and Political Conflict, 1888–1896 (Chicago, 1971), and the second is Paul Kleppner, The Cross of Culture: A Social Analysis of Midwestern Politics, 1850–1900 , 2d ed. (New York, 1970). Paolo E. Coletta, William Jennings Bryan: Political Evangelist, 1860–1908 (Lincoln, Nebr., 1964), the first volume of the most detailed biography of Bryan, provides important information on McKinley's opponent in the elections of 1896 and 1900. Stanley L. Jones presents a thorough, even-handed treatment in The Presidential Election of 1896 (Madison, Wis., 1964). Another examination of the 1896 election is Paul W. Glad, McKinley, Bryan, and the People (Philadelphia, 1964). In recent years two thorough studies of the Spanish-American War have provided depth to historical understanding of that important development of McKinley's presidency. Throughout The War with Spain in 1898 (New York, 1981), David F. Trask treats military action with a sure hand. His conclusions are for the most part consistent with the thesis advanced by John L. Offner in An Unwanted War: The Diplomacy of the United States and Spain over Cuba, 1895–1898 (Chapel Hill, N.C., 1992). Neither scholar views McKinley as committing the nation to war in order to establish the United States as an imperial power. Nevertheless, the American position in international affairs became increasingly important as McKinley's foreign policy evolved. In Imperial Democracy: The Emergence of America as a Great Power (New York, 1961), Ernest R. May portrays McKinley as a man of peace who succumbed to the hysterical clamor for war only because he feared the political effects of remaining neutral. In his American Imperialism: A Speculative Essay (New York, 1968), May argues that American leaders were following European precedents in their enthusiasm for overseas expansion. Far less supportive of the notion that "the United States had greatness thrust upon it," William Appleman Williams's thesis in The Tragedy of American Diplomacy (Cleveland, 1959) is that all interest groups in American society favored market expansion. Another work by Williams, The Roots of the Modern American Empire: A Study of the Growth and Shaping of Social Consciousness in a Marketplace Society (New York, 1969), elaborates on expansionist policy of the 1890s. American foreign policy at the turn of the century is the topic of several volumes. In The New Empire: An Interpretation of American Expansion, 1860–1898 (Ithaca, N.Y., 1963), Walter LaFeber argues that the American business community saw market expansion as a solution to economic problems of the 1890s. Thomas J. McCormick develops a related theme in China Market: America's Quest for Informal Empire, 1893–1901 (Chicago, 1967). Paul A. Varg's study The Making of a Myth: The United States and China, 1897–1912 (East Lansing, Mich., 1968), rejects the idea of an American economic interest in China. Marilyn Blatt Young, in The Rhetoric of Empire: American China Policy, 1895–1901 (Cambridge, Mass., 1969), links American imperialism with social and economic anxieties of the 1890s. David Healy's study U.S. Expansionism: The Imperialist Urge in the 1890s (Madison, Wis., 1970), also examines the great debate over acquisition of an American colonial empire. While other historians have differed over American foreign policy as it developed during McKinley's presidency, Swedish scholar Göran Rystad provides a reasonable synthesis in Ambiguous Imperialism: American Foreign Policy and Domestic Politics at the Turn of the Century (Stockholm, Sweden, 1975). Recent works include William H. Armstrong, Major McKinley: William McKinley and the Civil War (Kent, Ohio, 2000). Further references can be found in Lewis L. Gould and Craig H. Roell, comps., William McKinley: A Bibliography (Westport, Conn., 1988). uh fail. McKinley died during his presidency, because he was shot by Leon F. Czolgosz :D DUH! "you fool of a Took"